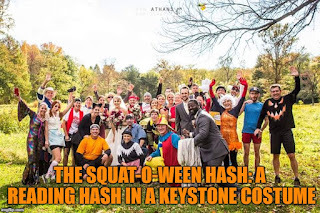 Everyone knows that Sir Squats A Lot is a Reading Hasher even though she identifies as Keystone during introductions. When she signed up to hare, but left it up to us to name it, we thought this was appropriate. In addition, she actually started with us fun loving RH3ers, but has never hared a Reading trail and was named by LVH3... So join us to break her Reading haring hymen. Who knows, maybe she'll get a proper RH3 naming too! Oh yeah, costumes aren't mandatory, but are strongly encouraged.